Masses of bright red berries in autumn to winter and lustrous, spiny, silver-margined, dark green leaves, purplish-pink when young. 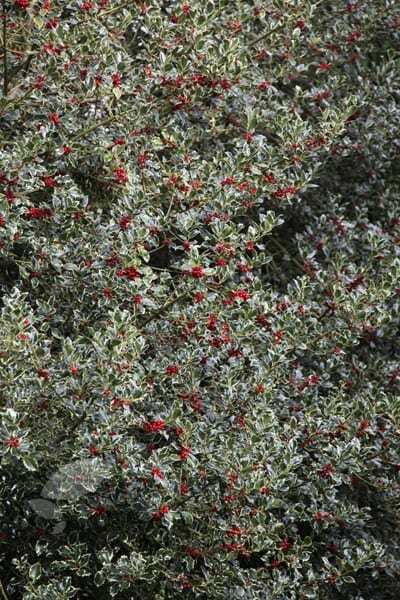 This splendid, silver-margined holly makes an excellent, evergreen specimen tree for a sunny, medium-sized garden. It's particularly suitable for urban or coastal sites since it copes well with pollution and salt-laden air. The stems are ideal for floral arrangements. Garden care: To guarantee berries it's necessary to plant a male holly nearby. Plants grown as free-standing specimens require minimal pruning - remove diseased or misplaced branches in spring. Trim plants grown as formal hedges in late summer. After pruning, apply a generous 5-7cm (2-3in) mulch of well-rotted compost or manure around the base of the plant. Bought as a Christmas gift for a friend who loved it. It was a present for a friend and it had to be high quality and that is why I used Crocus because I know their plants are of the highest standard. I would like 2 for my garden soon and will come back to Crocus! Training these as half standards to go either side of the front door, They are growing well and have already started to form a head at the top. The link to a male holly in a previous question is no longer working so presumably you no longer sell that one. Do you have any alternative male hollies which would go with this female? Pruning guide I have received your pruning guide which is very helpful. I notice that hedging holly has to be pruned this month (August) but I have a pot grown holly bush which has become very stragly - is this the right time to prune it? Can I grow roses through my holly hedge? I have a big, well established holly hedge and was wondering if I could grow a rose through it. The ground below the hedge is quite hard with all the roots of the holly, so should I dig some the roots out? I'm afraid I wouldn't recommend growing a rose through your holly hedge. The holly is too dense a shrub for the rose to grow through it easily and if the soil around the holly hedge is thick with roots then the rose really will struggle to thrive.